Following the shows in Osaka, Jang Keun Suk successfully finished the Niigata shows held on 26th and 27th, which has added momentum to his tour “2015 JANG KEUN SUK THE CRI SHOW 3”. The show colored by his own analog sensibility got good reputations such as it created a healing atmosphere, communicating with fans emotionally. Above all, throughout this tour, we can enjoy the live performance played by the same band so far. That’s why the stage has become more high-quality. 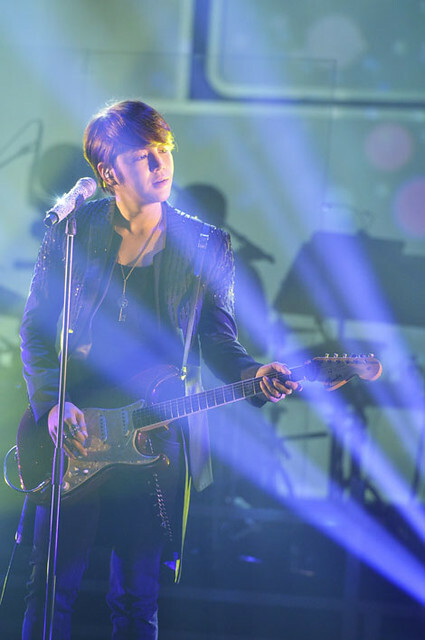 The bandmaster, Jang Ji-won said, “I establish a rhythm with him, just seeing his eyes”. That proved his faith in JKS. Starting with KBS music TV program ‘Timeless masterpieces 2 – singing legend’, Jang Ji-won is one of the best bandmaster who has worked with various artists such as SHINHWA, Vibe and so on. He said, “It was my first time working with a singer who is originally an actor. So I had a preconceived idea about his talent. But soon after I came to know how high-quality and perfect he pursues in the stage. I still remember his such professionalism gave me cold sweats even in our first practice. I understood he practices freely but, at the same time, pursues perfection, too. After that, I’ve come to join the practice well prepared with more responsibility and pressure. That’s why I don’t fail in JKS show”. 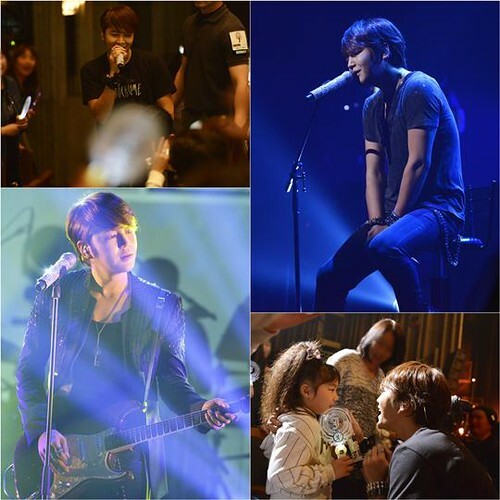 He added, “Every time I perform in JKS show, I get a new feeling. I mean I never feel the same even the set list is the same. I believe a song is not sung by talent only. I think JKS’ acting experience is very helpful to express songs more emotionally. He can sing a sad song more sadly, and happy song more happily. I think this is his unique strength”. In this tour, there is 16 performances in total; hall performances of 12 stages in 6 cities, and arena performances of 4 stages in 2 cities. Upcoming Fukuoka tour is held at Fukuoka Sunpalace on April 1st and 2nd. Love it when seasoned professionals sing his praises like this! Because JKS is still so young and isn’t afraid of showing his independent streak (whether it’s in fashion, hair, or running his own company), it’s easy to forget that he is a seasoned professional too! So, it’s nice when someone reminds people that this boy is talented and hard working! These are the articles we like to read. When they let go of the preconception they often got from the media they can see everything is just a lie and a lot of unjust is done to this young man. i’m so proud of being his eel.he’s really the best! Thank you for the translation, Tenshi. I read the direct Google translation of the original interview ahd had the impression that Jang Ji-won was highly impressed by JKS. However, your translation certainly clarifies the true meaning of his interview. It’s obvious JKS love music. It’s part of his being and pervades every cell of his body. He doesn’t sing with his head, he sings from every cell in his body…every fiber of his being. His acting talent enhances the feeling of the songs – the way he projects them to the audience – but is ability to give life to each song goes much deeper. There is a resonance between the song (lyrics and melody) and his being. Few singers are capable of feeling and emotionally understanding the music in the deepest part of themselves, let alone allowing that resonance to be expressed. That coming together of song and emotional understanding of the song, and its expression, is what makes a good singer great. Above and beyond JKS’ beautiful voice, his ability to understand the song and give emotional expression to it is what makes him a great singer. Personally, I’m grateful to both Jang Ji-won and Won dong yeon for publicly speaking out in favor of Keun Suk’s remarkable talents. I truly believe he has the talent to win an Oscar as well as a Grammy…and become a well-recognized international star. Thank you for translation ,he is unique man ho can act and sing at the same time .He put all his heart and mind to do this Crishow 3 more performamnt and unique . keun suk is very expressive guy..i think that talent keep growing with him..make him the best ententainer and artist. to be objective..his singing can still be improve but i dont think he focus too much on that.i dont mind though..i rather hear some off pitched singing than no feel singing. the feel go straight to ur heart without understand it. We can see Suk is not a routine singer or dancer.. I don’t mind him singing off pitch sometimes..even the fulltime profesional singers sings off pitch every now and then…even lipsyncing when they know they don’t have a good day..but not our Suk. As long as big companies in Korea continues to interfere with the ART..he will have problems with them …we all know the reasons..
Is really Impressive to read the wonderful coments from that amazing musician. He really admire our beautiful and talent Jang Keun Suk. Made feels super happy. So proud of our Boy… the more people getting to him better the more they will see how pure and unique he is. i’m not saying because i’m his eel but it’s true…. If they know him and still bash him they are really out of your mind or straight out evil !! No words to express my deep pride for him, I can just see him, my Star. That’s why I admire him, his talents! Thank you so much for the translation. Love the article. People who have worked with JKS always admire him for his many talents and hard work. I just wish I could see the Cri Show live. Fukuoka CS is tomorrow. Lucky eels who will be there must be very excited. He will probably travel to Japan already today. Thanks Tenshi for translating! These words warm my soul. I hope Keun Suk read these words. His desire for perfection, to achieve something new impresses and inspires those who have eyes to see, ears to hear and open mind to understand his struggles and achievements. To reach this level, he worked hard without stopping and without giving back. Head up, eyes toward the future, determined steps, clear mind and an open heart. This is our Prince! wow…those comments by professionals who work with him are so heartwarming. now they are starting to recognize his talent and talking about it…they have also admitted that they have changed their misconceptions of him when they have actually worked with him …these are the best praises ever because they came naturally and due to their up close exposure to him in the course of heir work…our prince is a truly professional hardworking young man who pursues perfection in everything he does…am so proud to be his eel.. I love this article! While I was reading those good praises, I feel like I wanna read more and more. I totally agree with the rest of the eels. HE IS THE BEST! THE ONE AND ONLY JANG KEUN SUK! I’m really new in this fandom.. but after watching some of his interviews and special DVDs, i came to respect him more. he has so much uniqueness in him that is so hard to ignore. such a talented, visionary, goal-driven, funny, compassionate and loyal person. I was so surprised to know that he’s so famous in Japan. I’ve been into Jpop for so long, but when i knew he guested in SMAP’s show.. , whoa i said “this guy is huge!”.. you really have to be famous to get invited in SMAP SMAP! I know he’s entering the military soon, maybe next week, but i want to see more of him.. perhaps in dramas? concert? Tv specials? variety? CFs? more JKS this year please!! He’s not going to the military at least this year, I think. Don’t worry. 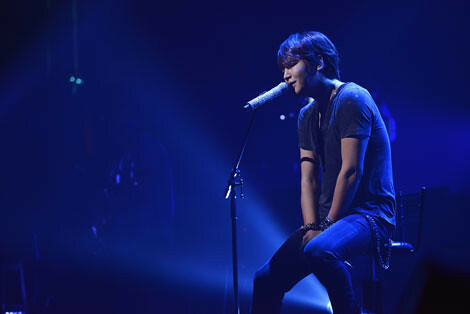 He’s touring CRI SHOW 3 until June, and going to appear in an acting project. wow really sis tenshi?? an acting project this year?!! that’s good news, I really miss keun suk, the actor.. any details about his next acting project? is it a drama or a movie? thanks much.. this blog is really the best!